Dasyuromorphia is an order of mammals that includes most of the Australasian carnivorous marsupials, including quolls, dunnarts, the numbat, the Tasmanian devil, and the Tasmanian wolf. There are two extant families of dasyurmorphians, Myrmecobiidae (with one extant species, the numbat, Myrmecobius fasciatus) and Dasyuridae (with about 20 extant genera and over 70 species, including quolls, dunnarts, and the Tasmanian devil). a third family, Thylacinidae, is assumed to have gone extinct in the 20th Century with the demise of the thylacine (Thylacinus cynocephalus, also known as the Tasmanian wolf or Tasmanian tiger). Dasyurmorphians are found in Australia, New Guinea, Tasmania, and some nearby islands. 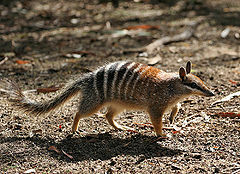 Some dasyurmomorphians, such as the the numbat, serve in the control of social insects, and some of the larger dasyurids, such as the Tasmanian devil and various quolls, play an ecological role in eating carrion, including dead wallabies and wombats. For humans, the unique appearance of dasyuromorphians add to the beauty of nature. While there is large size variation among extant members of Dasyuromorphia, the body shape tends toward uniformity. Dasyuromorphians move on four legs (quadrupedal), have pointed and generally long snouts, have long tails (Dasyuromorphia means "hairy tail"), have four toes on the front feet and four or five toes on the hind feet, and many have a clawless toe on the hind feet. Dasyuromorphians have polyprotodont dentition (multiple lower incisor teeth as opposed to diprotodont dentition with two lower incisors), with four upper and three lower incisors. Members of the order Peramelemorphia (the bandicoots and bilbies) are another example of marsupials that are polyprotodont, as opposed to the diprotodont kangaroos, possums, wallabies, koala, and wombats, all of which have only two lower incisors. Unlike members of Peramelemorphia, the feet of dasyuromorphians tend not to have syndactylous digits (with the second and third toes fused together while maintaining separate claws). Most of the carnivorous marsupials in Australia and neighboring islands are placed in Dasyuromorphia. In Australia, the exceptions include the omnivorous bandicoots (order Peramelemorphia) and the marsupial moles (which eat meat but are very different and are now accorded an order of their own, Notoryctemorphia). On the other hand, numerous South American species of marsupials (orders Didelphimorphia, Paucituberculata, and Microbiotheria) are carnivorous. Unlike herbivores, which tend to become highly specialized for particular ecological niches and diversify greatly in form, carnivores tend to be broadly similar to one another, certainly on the level of gross external form. Just as northern hemisphere carnivores like cats, foxes, and weasels are much more alike in structure than, for example, camels, goats, pigs, and giraffes, so too are the marsupial predators constrained to retain general-purpose, look-alike forms—forms which mirror those of placental carnivores. The names given to them by early European settlers reflect this: the thylacine was called the Tasmanian Tiger, quolls were called native cats, and so on. The primary specialization among marsupial predators is that of size: prior to the massive environmental changes that came about with the arrival of humans about 50,000 years ago, there were several very large carnivores, none of them members of the Dasyuromorphia and all of them now extinct. Those marsupial predators among the dasyuromorphians that survived into historical times ranged from the wolf-sized thylacine to the tiny long-tailed planigale, which at 4 to 6 grams is less than half the size of a mouse. Most present-day dasyuromorphians, however, tend towards the lower end of the size scale, typically between about 15 or 20 grams and about 2 kilograms, or from the size of a domestic mouse to that of a small domestic cat. To provide context, the table below also shows other major branches of the marsupial tree. Myrmecobiidae is one of the two extant families of Dasyuromorphians. The only extant member of this family is Myrmecobius fasciatus, variously known as the numbat, banded anteater, and walpurti. It is a diurnal, termite-eating mammal characterized by a slender body with white stripes, narrow pointed snout, small mouth with numerous small teeth, and a long, sticky tongue. It is found in Western Australia. The range declined significantly since the arrival of Europeans, with the species surviving only in several remnant populations in two small patches of land in the Dryandra Woodland and the Perup Nature Reserve. Unlike most marsupials in which the females typically have an external pouch where the newborn are nursed, numbat females have no pouch. The four mammae (milk-secreating teats) are protected, however, by a patch of crimped, golden hair and by the swelling of the surrounding abdomen and thighs during lactation (Cooper 2011). Thylacinidae is an extinct family of dasyuromorphians, whose only species to survive into modern times was the thylacine (Thylacinus cynocephalus), also known as the Tasmanian wolf or Tasmanian tiger. All other thylacinids lived in prehistoric times in Australia, with specimens found in the fossil record dating back to the early Miocene. The thylacine was the largest known carnivorous marsupial of modern times. 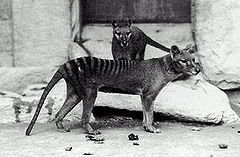 In addition to being commonly known as the Tasmanian tiger (because of its striped back) or the Tasmanian wolf, the thylacine also has been referred to by a range of other names, including marsupial wolf, hyena, zebra wolf, kangaroo wolf, zebra opossum, marsupial tiger, tiger cat, Tasmanian pouched wolf, and hyena opossum. This diversity of common names often makes clear identification of the species in historical records difficult. Native to continental Australia, Tasmania, and New Guinea, it is thought to have become extinct in the 20th century. Surviving evidence suggests that it was a relatively shy, nocturnal creature with the general appearance of a medium-to-large-size dog, except for its stiff tail and abdominal pouch (which was reminiscent of a kangaroo) and a series of dark transverse stripes that radiated from the top of its back (making it look a bit like a tiger). Dasyuridae includes about 75 species divided into 15 genera. 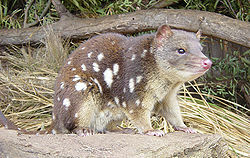 Dasyurids are known by such common names as quolls, dunnarts, and the Tasmanian devil. Dasyurids are found in Australia and New Guinea. They inhabit a wide range of environments, including grassland, forests, and mountains, and some species are arboreal or semiaquatic. Many dasyurids are small and mouse-like, leading to the misnomer "marsupial mice," but the group also includes the cat-sized quolls, as well as the Tasmanian devil. The smallest species is the Pilbara ningaui, which is from 4.6 to 5.7 cm in length, and weighs just 2–9 grams, while the largest, the Tasmanian devil, is 57–65 cm long, and weighs from 6–8 kg. The smaller dasyurids typically resemble shrews or mice in appearance, with long tails and narrow, pointed noses. The larger species bear a resemblance to such placental carnivores as mongooses or mustelids (Lee 1984). Many features of dasyurids are considered primitive, that is, they resemble the features of the earliest marsupials, from which other species, such as kangaroos and bandicoots, later diverged. For example, all of the toes in dasyurids are separate, whereas in many other marsupials, the second and third toes are fused. Similarly, many species lack a full marsupial pouch; instead they have a simple fold of skin surrounding the teats to provide some protection to the developing young. The dentition of dasyurids is also considered primitive, and differs from that of other marsupials, with a dental formula of: . Dasyurids are primarily insectivorous, but they will also eat small lizards, fruit, and flowers. One of the few exceptions to this rule is the Tasmanian devil, which subsists mainly on vertebrate carrion (Lee 1984).They have relatively simple digestive tracts, as is typical of insectivores and carnivores. Gestation lasts from 12–16 days, and results in the birth of from two to 12 young, depending on species. Smaller species typically breed at least twice a year, while the larger forms tend to breed just once. 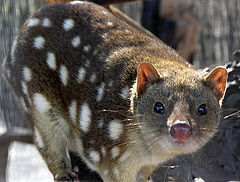 The length of lactation reflects this, with young dunnarts, for example, being weaned after 60–70 days, but young quolls only after 8–9 months. Most dasyurid species are sexually mature at one year of age, but, again, the quolls and Tasmanian devil, being larger, take longer to mature and do not reach full adulthood for about two years (Lee 1984). Groves, C. 2005. Order Primates, Order Monotremata" (and select other orders). Page(s) 23-37 in D. E. Wilson and D. M. Reeder, eds., Mammal Species of the World, 3rd edition. Johns Hopkins University Press). ISBN 0801882214. Lee, A. K. 1984. Dasyuridae. Pages 838-845 in D. Macdonald, The Encyclopedia of Mammals. New York: Facts on File. ISBN 0871968711. Nihranz, D., and E. Colvin. 2013. Dasyuromorphia. Animal Diversity Web (University of Michigan-Ann Arbor). Retrieved May 08, 2014. Myers, P. 2001a. Dasyuridae. Animal Diversity Web (University of Michigan-Ann Arbor). Retrieved May 08, 2014. Myers, P. 2001b. Myrmecobiidae. Animal Diversity Web (University of Michigan-Ann Arbor). Retrieved May 08, 2014. Myers, P. 2001c. Thylacinidae. Animal Diversity Web (University of Michigan-Ann Arbor). Retrieved May 08, 2014. Wilson, D. E., and D. M. Reeder (eds.). 2005. Mammal Species of the World, 3rd ed.. Baltimore: Johns Hopkins University. ISBN 9780801882210. This page was last modified on 11 May 2014, at 21:55.